For those of you unfortunate enough to have to avoid almost everything that tastes nice. 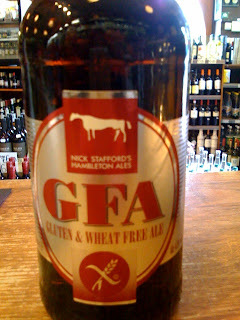 I have a new gluten and wheat free ale that just arrived today - Nick Stafford Ales G.F.A. It's a fairly reasonable price in comparison to other gluten-free beers- 500ml bottle is €3.79. Things are looking up even though you still can't have a crisp sandwich!!! Available in Deveney's of Dundrum. I've had stomach issues for close to 10 years now. At one point I was diagnosed with a gluten allergy. For 6 months I lived on the lousy gluten-free diet...it was hell! Luckily they realized their mistake and I went back to (relatively) normal live. Anyhow...my point being that it's great to see companies make gluten free product. I went without beer for those 6 months because no one in the US was producing gluten free beer at that time. I sometimes wake up in cold sweats in the middle of the night; nightmares and flashbacks of those beer-less days. I totally agree with you and I love that it's at a reasonable price point aswell, I've sold other wheat and gluten free beers that you'd almost have to pay with a credit card for a six pack of 330ml.I appreciate that they're more expensive to produce but the majority of them taste like dish-water. Glad to hear that you're illness wasn't a permanent beer-less lifestyle change!!! That could have been disasterous.